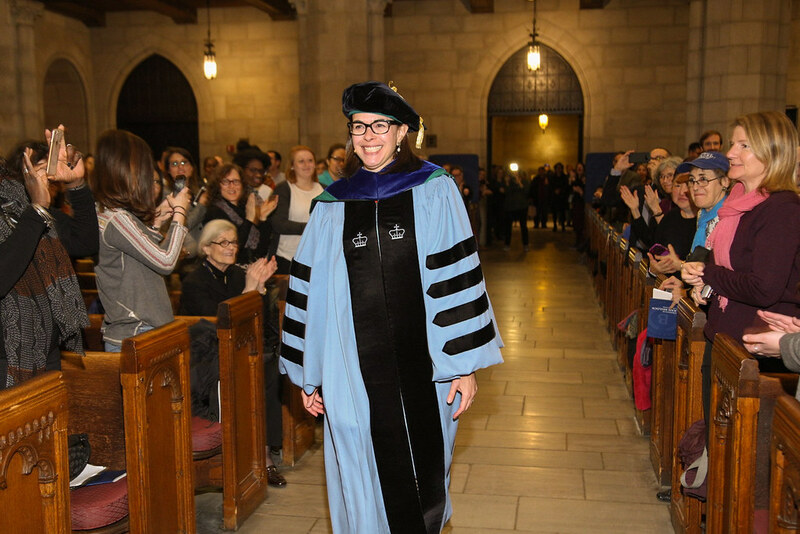 The Inauguration of Sian Leah Beilock as the Eighth President of Barnard College took place on February 9, 2018. Across the Morningside Heights campus, at the Empire State Building—lit up in Barnard blue—and within the majestic Riverside Church, the community united to celebrate the Inauguration of the eighth president of Barnard College, Sian Leah Beilock, on February 9, 2018. The Inauguration ceremony, an academic tradition dating back centuries, marked the official conferring of the presidency. In her inaugural address, President Beilock articulated her vision for the future of Barnard College, emphasizing four key priorities: focusing on science as part of the liberal arts; continuing to extend learning beyond the classroom to all of New York City; strengthening the College’s mission to be diverse and inclusive; and enabling students to succeed after they graduate. Second, President Beilock affirmed Barnard’s position as a college that is “not just in New York City—it is of the city.” Students already explore New York City as their extended classroom, particularly in Harlem and Morningside Heights. Over the next few years, as Barnard begins to offer several new, combined bachelor/masters programs with Columbia University, the College will "extend learning further using the city's resources," pushing the boundaries of the classroom in new and creative ways. Third, Barnard will renew its commitment to educate young women from historically underrepresented groups—“a tradition that the College has upheld since its founding.” From growing faculty diversity to ensuring that Barnard is “an inclusive environment free from fear and hate,” the College will build on its promises to offer open dialogue, understanding, and support so that every student can learn and perform to their potential. Fourth, President Beilock announced a new initiative, Beyond Barnard, that will expand and integrate the resources provided to students and alumnae for life beyond the College and help them achieve success in their chosen fields. Jointly directed by Provost Linda Bell and Dean of the College Avis Hinkson, Beyond Barnard will ensure that Barnard students have the tools they need to put their education into practice—whether in academic, industry, government, or nonprofit roles. By more effectively connecting classroom experiences with co-curricular activities such as internships, research, and field placements, Beyond Barnard will create a stronger pathway for students to achieve their goals after college and throughout their lives. In addition to speeches, the ceremony featured the musical performances of Professor of Professional Practice Gail Archer and the Barnard-Columbia Chorus. Professor of English Saskia Hamilton recited poetry written by Elizabeth Bishop. The celebrations that began on February 8 touched every corner of the campus: An open house hosted by the Council on Diversity and Inclusion; tours of the famed Arthur Ross Greenhouse; and a Tunnel Gallery exhibit on the history of Barnard College, curated by Robert McCaughey, Professor of History and Janet H. Robb Chair in the Social Sciences, made the Inauguration a community event to remember. —The Empire State Building image ® is a registered trademark of ESRT Empire State Building, L.L.C. and is used with permission.